Coasts and shores occupy quite different locations in both history and geography. Long before countries thought of themselves as having something called coasts, they had shores. Coasts are a relatively recent concept, reflecting the modern impulse to bring nature under control, to draw lines and impose uniformity where neither previously existed. It was not until the eighteenth century that the notion of the coastline was deployed. First conjured in the minds of cartographers, it has now been so massively engineered into the environment as to appear natural. The British geopolitican Lord Curzon called it “the most uncompromising, least alterable and most effective” of borders. Coasts are the product of human design, while shores belong to nature, are alive and unruly, famously described by Rachel Carson as an “elusive and indefinable boundary.” They are fractal and irregular, assemblages of micro environments, no one quite like another. Nature’s shores are fractal rather than linear. And they vary by time as well as space, changing with every tide, with each storm. people. In Maine, Carson’s favorite shore, only 25 of its 5300 miles of coast are designated as working waterfronts. Of California’s 1,100 miles of coast, all of it below the highest tide line is accessible, but only 42 percent is publically owned. Everywhere getting down to the sea has become more complicated and contested. Little of the terrestrial shore can any longer be categorized as wild in the way that Carson understood that term. 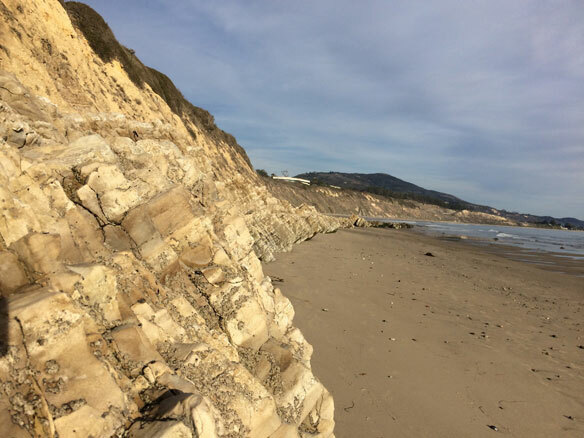 The anthropogenic coast has now obliterated nature’s shore in many places, including California, where one observer notes that you can no longer see the shore for the stores. Nature’s shores, as opposed to built coasts, are porous and fluctuant. That is what attracted humans to the southern tip of Africa some 165,000 years ago. Mossel Bay in what is now South Africa offered the fecundity of an ecotone where two ecosystems, one of land, the other of water, met. This was the first home of Homo Sapiens from which our species has evolved. Shores were fluid frontiers which liberated humans to move about the world in an unprecedented manner. Today’s coasts, engineered to separate land and water, have radically reduced biodiversity and cut off the movement of fish and peoples. The sand that once nourished barrier islands and beaches is a necessary constituent of the concrete used to build sea walls and levees which stop the natural flow of sands and are the death of beaches. In Indonesia, sand mining has destroyed whole islands. So-called sand wars are won by the strongest states and highest bidders, often at the expense of the poor, who have seen their homes and livelihoods vanish beneath the waves. In Japan, a massive state-subsidized concrete industry has walled 65 percent of that nation’s coasts with disastrous ecological results. 21, 2014) sea walling and massive beach nourishment projects are not only environmentally damaging, but lead to a false sense of security based on the mistaken notion that we can engineer ourselves out of danger. In many parts of the globe the dream of taming unruly shores has proved to be a costly illusion. What was meant to stabilize has become itself the source of instability. In Japan, the massive sea walls built to protect against tsunamis enhanced the velocity and force of the destructive storm surges which natural wetlands and gently sloping shores would have dissipated. Our ancestors knew better. Their name for shore was marge, a word that suggests not a narrow hard edge but a broad soft margin. Premodern maps portray a series of disconnected points rather than a continuous coast. Until surveyed in the early nineteenth century, shores were terra incognita to both mariners and landlubbers. Cautious captains stayed well off shore and houses were rarely built at the edge of the sea. Unlike contemporary developers, premodern coastal peoples left themselves a wide margin for error. Shores were the world’s most extensive commons, open to all up to the high tide line. Today they are more likely to be treated as private property, with access increasing restricted by fences and barriers. The recent massive destruction of up to 90 percent of coastal wetlands has hardened the line between land and sea, eliminating one of nature’s great nurseries but also alienating us from the sea. Today’s coasts are under assault by rising seas and storm-induced erosion, calling the very idea of coastline into question. What we like to think of as our most natural boundary is revealed to be among the most unnatural. Fortunately, what is left of our unruly shores still offers hope for resolution of at least some of the problems associated with modern coasts. It turns out that shores have a remarkable ability to heal themselves if only left to their own devices. Instead of pinning them down, narrowing them to that thin line which has no counterpart in nature, we should be allowing them to find their own shape and flow. It is time to focus our attention on flow rather than fixity. The great geoengineering projects of the past, sea walls as well as dams, have all been called into question. But we are not without historical examples of floating cities and aquaculture that can be as secure and productive as any static territorial system of based on impenetrable borders. The Dutch are now in the forefront of the reimagining the place where land and water meet as a fluid frontier. Shore dwellers of NewYork and New Jersey have much to learn from them. We cannot roll back coasts any more than we can hold back seas, but we can, given our present level of environmental awareness, work out a variety of accommodations that meet our commercial interests without sacrificing the global environment. But the first requirement is to recognize that coasts and shores are very different phenomena and then make them work with rather than against one another. Teasing apart shore and coast is not just a semantic exercise, for behind our choice of words lie powerful political and economic forces. To call a shore “coast” is to align it with a certain kind of territoriality. It encourages us to opt for certain measures – sea walling and beach nourishment – which are presented to us as coastal protection, when, in fact, they cause shore erosion. Calling something a shore evokes its natural qualities and leads to a different kind of planning focused on maximizing the life that exists there. Clarifying the difference between coasts and shores would therefore go a long way toward creating the basis of a public discussion of what is really at stake. Clearly there is a place for both coasts and shores in our conception of our world. But confusing one with the other does a service to neither. In his new book, The Human Shore: Seacoasts in History, published by University of Chicago Press, November 2012, historian John R. Gillis explores the deep history of seacoasts, the original home of humankind.